A few weeks ago my wife wanted to stop by Old Navy to look for some yoga attire. As the designated retail pack-mule, I found myself standing by the women’s athletic gear killing time while my spouse decided between identical pairs of black stretchy pants. Glancing over the display, I noticed an interesting trend in the athletic tops: cringe-worthy idioms. 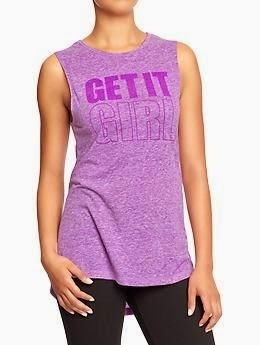 You Go (to the gym) Girl! The clothing problems for girls apparently can begin in utero. My wife was explaining that she had pre-ordered an outfit so that we could get it on its day that it is released. Please allow that to sink in. Things have gotten so bad that children’s clothing now has a street date. I wonder if there are people standing outside a Gymboree the night before discussing rumors. I can only hope that this release date business has created a thriving black market scene. Hordes of desperate middle-class parents ducking into alleys and avoiding eye contact as they whisper, “Anybody got the 2015 smocked kitten pattern in a 2T?” as nonchalantly as possible. Their inquiries undoubtedly met with suspicion until some guy in a trench coat presented a hypothetical situation where he might know a guy who did time with the dock manager at Zulily. But just before the conversation can continue, a lookout shouts “five-0!” and the minivans scatter just as quickly and mysteriously as they appeared.